Dutty Dancing returns to Goodgod with very special international guests Electric Punanny! 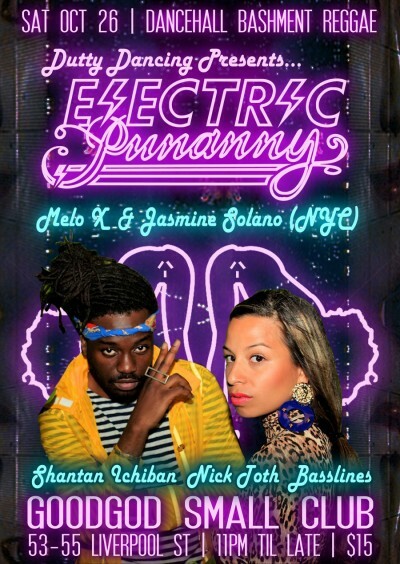 Run by Jasmine Solano and MeLo-X, Electric Punanny is one of NYC’s most popular monthly parties, combining dancehall reggae, hip hop and electronic sounds, which has turned into an international party filling rooms with packed bodies, sweating, grinding and daggering alll night. More than just a DJ Set, Melo X and Jasmine Solano are known for getting on the mic, getting outrageous and turning the party out. Melo-X is known as a cross genre producer and rapper, who’s remixes and mixtapes have been getting a huge buzz worldwide. Meanwhile, Jasmine Solano is a Rapper slash DJ slash “Mistress of Ceremonies”, who’s amazing party presence has seen her rock the coolest parties worldwide from The Do Over (Los Angeles) to Hipsters Can’t Dance (London) just to name a couple. Their powers combined have created a party is the most fun you will have in New York. A night at the forefront of the clash of musical cultures, that has hosted the likes of MAJOR LAZER, THEOLOPHILIS LONDON, JOVI ROCKWELL, and will have you wining like you have never done before.